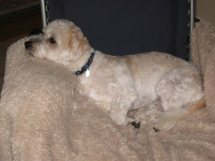 Very active dog, gets hot here in GA, short puppy cut is much more manageable for both of us. Relaxing & watching some tv between naps. What a life. LOOKS TO US LIKE YOU HAVE IT MADE LOUIE!! SURE LOOKS LIKE A DOGS LIFE. ENJOY!